Breakfast is known to be one of the most important meals of the day; it gets you going to take on the day ahead and also stops you from reaching for sweets and fast food during lunch. Some people, however, forget that sugary cereals, Nutella loaded white bread and fruit juices with added sugar don’t count as starting your day right. I was horrible with eating right, but thankfully I changed into a healthy lifestyle two years ago. Most people wonder how I can eat clean and mostly wholefoods all the time, but it’s quite easy once you see how much more energy you have with a balanced diet. It’s also easy if you can still have great taste with your healthy meals and snacks. Here are some breakfast ideas that are healthy, filling and most importantly, delicious! Oats mixed with mashed banana to sweeten and topped with strawberries and apple, with a side of green tea. 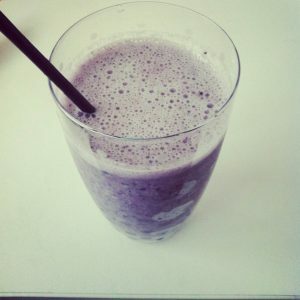 Smoothie made with one banana, cup soymilk and handful of blueberries. Cut up apple and pear topped with half cup cottage cheese, cinnamon and sultanas. Pancakes made with only one mashed banana and egg combined and cooked with coconut oil. 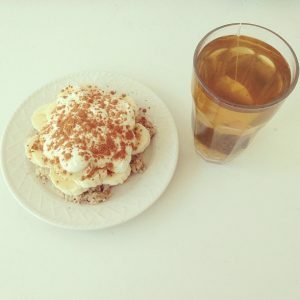 Topped it off with sliced banana, greek yoghurt with cinnamon and green tea on the side. Oats with Greek yoghurt, sliced banana, frozen raspberries and fibre bran. All these breakfast ideas contain no added sugar, salt or oils (other than the coconut oil used for the pancakes). They are quite filling and can get me through to lunch time without feeling hungry. 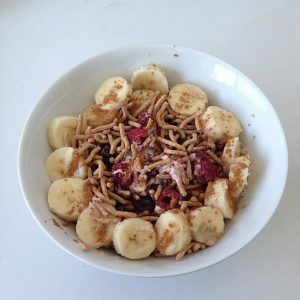 What are some of your healthy breakfast ideas?